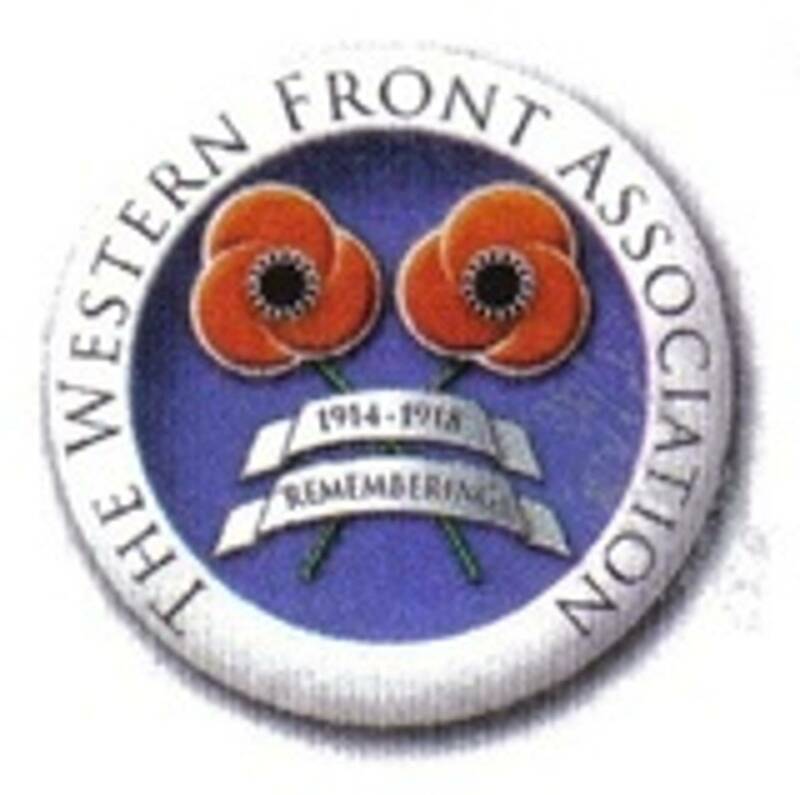 Dublin Western Front Association - 19 September, 1915/2015. Branch Meeting, 19 September, 2015. 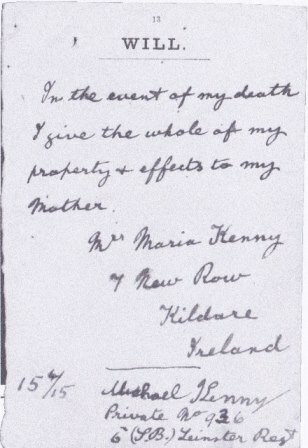 Michael was born circa 1893 in Kildare, (1) the son of John & Maria Kenny, (2) the 1911 Census shows that the family was living in New Row, Kildare Town (3) and Michael was employed as a labourer. Given that he served in the 6th (New Army) Battalion, which had been raised in Dublin in August 1914, it seems likely that Michael joined up soon after that time and went into training with the rest of the new recruit?s. The battalion was placed under the command of 29th Brigade in the 10th (Irish) Division, they moved firstly to Fermoy, on to the Curragh and by October were at Birr before returning to the Curragh in February 1915. 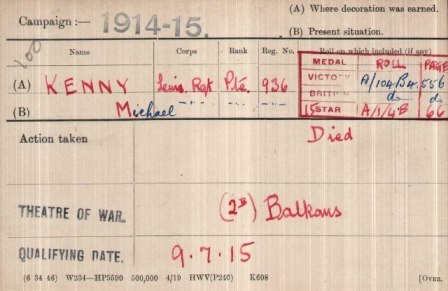 In May they moved to the UK mainland eventually embarking at Liverpool and proceeding to Mudros, Michaels Medal Index Card shows that he entered the Balkans Theatre of War on 9th July. The battalion then landed at Anzac Cove, on the Gallipoli peninsula on 5th August. From the various records that are available, we know that at some point Michael contracted Dysentery, he was evacuated from the peninsula, and was presumably on his way back to the UK when he died from the disease on 19th September, 1915, whilst on board HMT Huntsend (4). Michael is buried in Plymouth (Weston Mill) Cemetery, and he was entitled to the 1915 Star and the British War & Victory Medals. 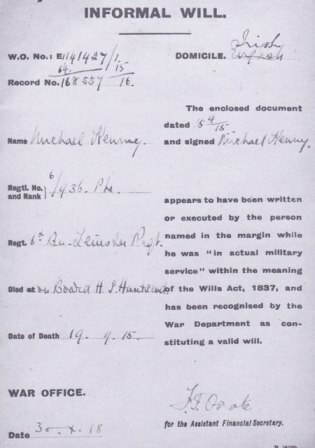 Michael?s entry in the Leinsters Medal Roll for the award of the 1915 Star, this confirms the date and cause of his death. away on board the ?Huntsend?. (1) Probably in Kildare Town. (2) The 1911 Census shows that he was one of 14 children of whom 9 were still alive. (3) Michael was the only child still living with his parents, although his 8 year old niece, also lived with them. 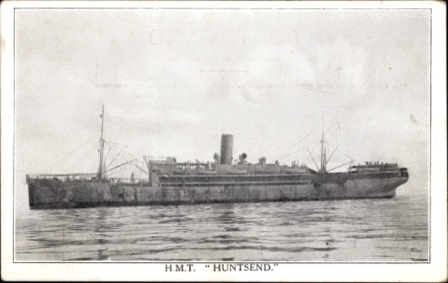 (4) This was formerly a German ship named the Lutzow, seized in Suez in August 1914, it was renamed the Huntsend and was used as a hospital ship to evacuated ill and wounded troops from Gallipoli.